“Tell me a story,” noted ecologist, and Hudson Valley local, Thomas Berry demanded in his environmental studies classic, The Dream of the Earth. “A story of where we are and how we got here… a story that brings together the human community with every living being in the valley.” In fact, what he was asking for was an aware and inclusive story of the Hudson Valley. Nearly 40 years later, students in the Ecology of Food class are reading, living, and thinking through Berry’s call to ecological engagement. While classrooms are wonderful places of learning, we cannot fully understand the ecosystem of which we are a part until we are out in it. That is why, at the tail end of winter and just as we are starting to tip into the earliest moments of spring, students in the Ecology of Food class can be found out on campus beneath the maple trees—drilling holes into trunks, fitting spiles, and mounting buckets. For two weeks after that, students stomp through drifts of snow, skid across ice slicks, or squish through mud to collect the sap that is then boiled down into syrup. And soon after that project ends a new one begins. Seeds for the campus Teaching Garden must be chosen and then germinated under grow lights. As spring wears on, students clean up the beds in the garden as well as the berry and fig bushes on the hill behind it. They check on our perennials—herbs that students will soon use to cook with at home and in their classes—and plant the new vegetable and herb starts that we’d raised. They make sure our composting system is in order and ready to continue the job of turning waste into soil nutrients. And soon, harvesting is upon us! First, they harvest the early greens and herbs, and then the berries, radishes, carrots, and beets. After that, comes tomatoes, corn, and potatoes, and finally, the fall crops. Before we know it, winter will be here and the whole cycle will slow for a short time before it all starts up again. And while all of these activities might sound like a bit of an agrarian fantasy, they reveal only some of the ways students are working to evolve their thinking. 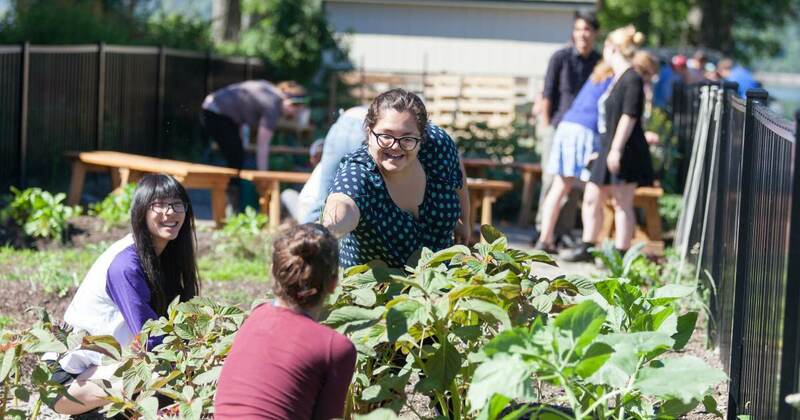 Perhaps unsurprisingly, CIA students in the Applied Food Studies program are positioning themselves not only to be great chefs but also to be excellent stewards of the environment. As it turns out, the two goals go hand in hand. Students’ dedication to food and hospitable service drives their interest to learn more about our food systems—where our seeds come from, how our access to water and varieties of food are impacted by our changing climate, how people access and use the food they purchase or grow, and how they deal with or are challenged by food security during times of economic upheaval and environmental stress. Even as students in the course are reading classic and cutting-edge texts in ecological studies and food studies, they are also undertaking research as participants with a local seed library in trials for newly rediscovered heirloom vegetables. They are growing a very rare variety of corn valued for making polenta and nurturing a range of Syrian vegetables for seed harvest. They will contribute the seeds to a bank for Syrian refugees displaced from their homelands. As students in the Ecology of Food class demonstrate, knowing and doing are two essential parts of dedicated learning. Reading and studying the point where ecological and food studies meet while learning to maintain the healthy soil that produces the food they grow in our garden, is an intense experience. It’s also an experience that matters because it allows them to see the story “of where we are and how we got here.” Pretty soon, we’ll be asking these students to “Tell me a story,” about the complex world in which we live and feed ourselves. I can’t wait to hear their answers. By Dr. Deirdre Murphy , CIA professor of liberal arts.